In November 2001, a visitor from the South of Spain alerted the people of Tirau to the fact that the small town of Villa Del Rio is at the exact opposite side of the world to Tirau. Carlos Chevalier Marina who comes from Villa Del Rio, used a hand held GPS system, to locate the exact spot an ancient Roman bridge would lie, thousands of kilometres beneath a Tirau farm. This location turned out to be just west of Tirau along the Paparamu Road. The bridge, a dry stone edifice, is an impressive landmark in his town. Mr Carlos told Tirau residents Villa Del Rio is on the side of the main river in Andalusia. The town of 7000 people is surrounded by olive groves, cotton and corn fields. Over recent years Villa Del Rio has become important as a furniture manufacturing town exporting goods to Eastern Europe and the Middle East. Carlos had first dreamed of this journey since he was 15 years old and with the help of Dalton Poppe from the Big Dog Information Centre and Henry Clothier, he completed his quest of mapping the two areas at the exact opposite ends of the earth. 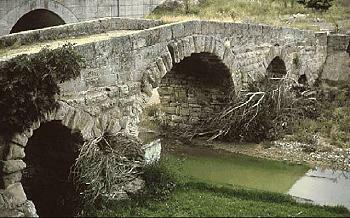 Ancient Roman bridge, Villa Del Rio, Spain.